Let us speak of the wonderful conception of the Honorable Forerunner - since it could stand as the beginning of the whole narrative - and put in order what we are triumphantly about to mention, insofar it pleases him whom we are praising today to give us the power of speech. But it might be better to begin our talk with events that preceded the conception. In this way we can demonstrate that, even before his conception, it was clear that he would become a great and important person and that he would meet the expectations of people in matters of salvation, since he would not be exempt from the consequences which the fall of the Adam and Eve had for the whole of humankind. As a result of this fall, we had reached the point where we were living on earth in misery and degeneracy, as the general legatees of God’s decision: “You are dust and shall return to dust” (Gen. 3, 19). This was our natural destination, as the verdict on our disobedience. But this misery of people’s lives wasn’t the only thing. It was followed by apostasy from God. Because we forgot the Lord God, the creator of the universe and often worshiped other people who were as sunk in sin and wretchedness as the rest of us. Or, at other times, we had objects for gods, idols we’d made with our own hands. We then became involved in the passions of dishonor, since we offered the honor and worship which were proper only to God to inanimate idols and to the demons. We had fallen to such unprecedented depths of perversion that the cure would have to be of the same order of power and magnitude. And the sole cure for this condition was for God the Creator to resemble His creatures. In other words, for God to become a being like us, taking on a human body and a human soul. And so, as a real person, He took on all the capacities of human nature, as it is when it is free from sin. In other words he adopted all the blameless passions. In His person, divine and human nature were perfectly and actually united and through this unification it became possible to save humankind, which was and is held prisoner by the sinful passions. And so the opportunity was given to every person to be reborn in Christ and acquire the eternal bliss which God intended for us from the moment He created us. God promised this bliss to people, prominent among whom was the elder and priest Zachariah, whose years had fled and, together with bodily decline, had brought him closer to death. He prayed to God often and diligently, that he would not be overtaken by death before he saw the Savior of the world, Whom everyone was awaiting. This saintly old man always made this prayer to God begging him both to make the light of salvation shine soon and also to allow him personally to see the dawning of that light. And, so that death wouldn’t seize him before he participated in this vision, just at the moment when the fullness of time for it arrived, he constantly repeated this prayer, but particularly when, as a priest he offered God his liturgical services, in accordance with the Law. He did this every time it was his turn, as a priest, to enter the Holy of Holies to offer incense. This was where, once a year, the High Priest entered with his hands sprinkled with blood, denoting in this manner, the sacrifice of Christ our Savior which would be the unique and real sacrifice, offered to His God and Father by Him Who was Himself High Priest and victim, a lamb sacrificed for the salvation of all humankind. Zachariah, then, was in the Holy of Holies, both because he was worthy to be there and also by virtue of his sacerdotal office which permitted this. While he was at the altar, then, praying his diligent prayer, he received a visit from a heavenly angel. He saw the angel standing to the right of the altar where he was offering incense and he talked to Zachariah about the coming of the Word of God to earth, thus passing on to him the most celestial and joyful tidings. The angel who brought this important message was the Archangel Gabriel. His name alone [=strong man of God] demonstrates the significance of the messages he brought. He’d come to the altar to announce wonderful events, which would occur before the incarnation of God, which Zachariah had so assiduously implored. The angel of God saw that Zachariah was greatly troubled at the sight of him and that the more frightened he became the more troubled he felt. The Bible (Luke 1, 12) says “And Zachariah was troubled when he saw him and fear fell upon him”. Zachariah’s terror revealed that the time had come when the absolute power of the Law of the Old Testament had passed and that henceforth people would follow the path of the Gospel. So Gabriel dispelled Zachariah’s fears and then told him the good tidings. Because what he had to tell him did not cause fear but rather fearlessness and delight. What did he say to him? “Do not fear, for God has heard your prayer”. He didn’t just ask him “What are you afraid of, venerable old man, what are you afraid of now you’ve got what you wanted? What are you afraid of now that you’re free of the burden of worship of the Law? Why are you upset now that you see the light in the darkness. Why are you surprised now that you see those who were troubled becoming established in the Grace of God?” But he added: “These messages I bring you are beyond wonder, but they don’t inspire fear in those that hear them. I have great mysteries to reveal to you, but you must not be troubled, especially now that you’re about to hear them. On the contrary, you should be glad and delighted with me, because by their nature these things cause joy and gladness. Deliverance is at hand”. “The time’s come for the fallen to arise. The law’s found its true purpose. The time of Divine Grace has dawned. And very soon you’ll see, before your own eyes, Him Who is the summation of everything I’ve told you. You’ll see the Word of God become incarnate through a Virgin, be born as all you human beings are and save the whole human race. And you’ll not only wonder at what you desire so ardently to see, but you’ll also be fortunate enough to play a part in the events. And, so that you’ll believe what I say- and I ask you to do so- I’ll reveal another wonderful thing, which is that what you’d lost all hope of ever achieving will become a reality What exactly? Your wife, Elizabeth, will bear you a child and you’ll call him John. You yourself will feel joy and gladness, and many others will rejoice at his birth. He’ll prove to be great in the sight of the Lord; he won’t drink wine or alcoholic drinks; he’ll be full of the Holy Spirit even from the time he’s still in the womb; and through repentance he’ll bring back to God many of the children of Israel who have become estranged from Him. And he’ll go before Him with the spirit and power of the Prophet Elijah to turn the hearts of the fathers to their children and will bring back to the disobedient the outlook of the righteous. And he’ll prepare all those who are well disposed so that they’ll receive the Lord (Luke 1, 13-18). So do you see how these are events, attested by the voices of angels, about which John could boast, because they occurred at his conception, or even before then? This venerable elder and priest [Zachariah] not only believed in the Law, but taught it to others, as well. He still belonged among those who were awaiting the Messiah to comfort and save the people of Israel, and he prayed diligently for Him to come. He was, in fact a prefigurement and symbol of all those who relied on the Mosaic Law and would remain outside the faith in Christ. So, when he beheld the holy angel standing next to the altar and giving him this important message, why didn’t he accept what he was told with simple faith? Why didn’t he show the same faith as Abraham and Sarah had in similar circumstances? Even if he couldn’t manage that, he ought certainly to have accepted, with simple faith, the fact that, if God so willed He could perform any wondrous and supernatural act whatsoever. Because, of all that’s in the world, there’s nothing which, from some point of view, doesn’t owe its existence to the all-powerful will of God. Isn’t this what that wonderful person, Job, declared after he’d been taught by God, Who spoke to him and reassured him from a cloud? “I know that everything is possible for you and nothing is impossible” (Job, 42, 2). And again, if Zachariah believed that the voice talking to him was hostile and opposed to God, there was no reason for him to seek reassurance and explanations and to say: “How can I believe this?” He knew very well that the devil [from Greek διάβολος = “slanderer”] is a liar by nature and doesn’t ever speak the truth. So since his first words would be deceitful and his appearance deceptive, he would have no trouble continuing with his lies thereafter. In this way, he’d be able to fool and lead astray, into even greater lies and more dreadful deceptions, those he’d hoodwinked with his first lies. Not that Zachariah, who was to become the father of the great Baptist, was so naïve. Far from it. There’s no way that a witless father could have begotten such sweet fruit as John, who lived on honey in an effort to show people that they should choose the superior, spiritual way of life which is nourished and sweetened by God. I think, as I have said, that the venerable elder Zachariah went into a state of ecstasy, as did Isaac once, in order to prefigure the abolition of the Law with the coming of Christ and to demonstrate how difficult it would be for those who blindly persisted in the ordinances of the Law to accept Him. And also because he had to announce and manifest that the gentiles would welcome the thunderous voice of the Gospel which would be heard to the ends of the earth and bring the Grace of God to people. So, deep in his soul, this great priest didn’t believe and, as a result, lost his voice, in order to show how illogical the disbelief of the Jews would be. And we can say that John, the Forerunner of God the Word, was begotten by Zachariah and was the heir to the virtues of his father. This is clear from the words which Christ Himself said later: “A good tree cannot bear evil fruit, nor can a rotten tree bear good fruit” (Matth. 7, 18). And I might add that, given his reluctance to believe, Zachariah was, in this respect, less virtuous than his wife, Elizabeth. 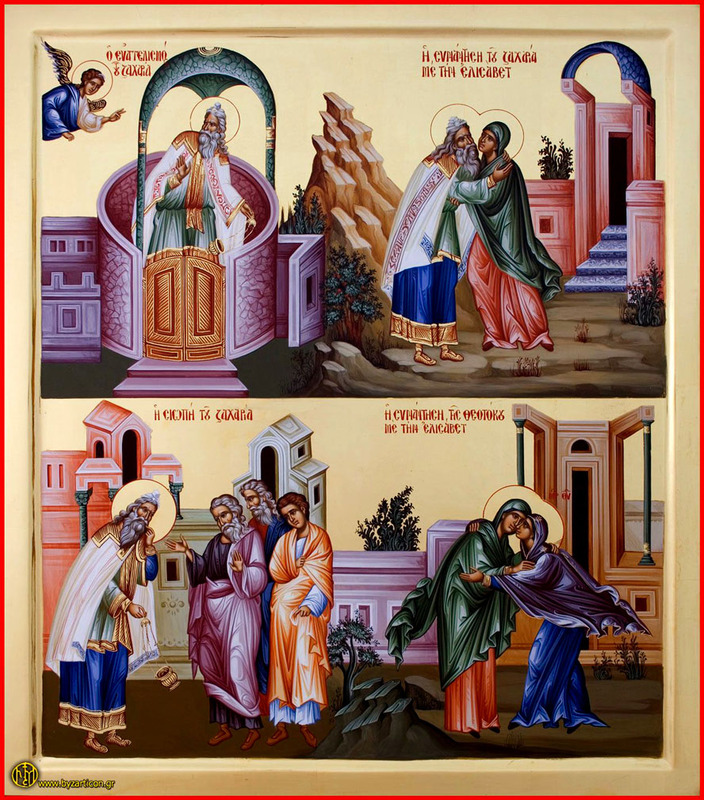 Because she didn’t hear the words of the angel nor did Zachariah tell her, since he’d lost the power of speech before he returned home, but she realized the true condition of the Virgin Mary when she went to meet her. No sooner had they embraced than she called her “Mother of God”, saying; “Blessed are you among women and blessed is the fruit of your womb. And what have I done that the mother of my Lord should come to me. For behold, when the sound of your greeting came to my ears, the baby in my womb leapt for joy” (Luke, 1, 42-44). And she went on to say: “Blessed is she that believed; for there shall be a fulfillment of the things which have been spoken to her from the Lord” (Luke, 1, 45). So, by the Grace of the Holy Spirit, Elizabeth not only realized Who had impregnated the Virgin Mary, but she was also well-informed as regards what God had revealed and promised to her with His angel. That’s really something that we might consider unusual and hard to believe. Zachariah was prepared by God and was, in God’s hand, a perfect and proper instrument. This is apparent not only from the fact that the same angel was sent to Zachariah as presented the mystery of the Annunciation to the Mother of God and had the privilege of telling him about the birth of John, who would be the Lord’s kinsman, but is also confirmed by the ode about Christ which Zachariah prophetically composed at the birth of John (Luke 1, 68-79). And the spiritual stature of Zachariah is confirmed by the words he prophesied regarding his own son: “And you, son, will be called the prophet of the Most High. For you shall go before the face of the Lord to make ready his ways; to give knowledge of salvation to his people, in the remission of their sins” (Luke 1, 76-8). And he didn’t say this with his own powers, but rather because he was filled with the Holy Spirit. This is written in the Gospels which say of him: “And his father, Zachariah, was filled with the Holy Spirit and prophesied” (Luke, 1, 67). It’s obvious that Zachariah couldn’t have been filled with the Holy Spirit unless he was trustworthy and receptive towards Him. Nor would he have become the father of John if he hadn’t been worthy of the honor. So all this, which preceded the conception of Saint John, demonstrates that he really was the greatest of men, even before he was conceived. Jesus Christ Himself, Who is the Very Truth, testified to John in such a way that no-one can claim that he’s lesser than any other man, because he wouldn’t have been born of such great and prominent parents. This is precisely what the Holy Gospel was pursuing, through what we said above, wishing to silence anyone who would doubt the uniqueness and greatness of John: “And they were both righteous before God, walking blameless in all the commandments and ordinances of the Lord” (Luke 1, 6). What does this mean? This Gospel testimony regarding John’s parentage, Zachariah and Elizabeth, reveals that they lived at the pinnacle of virtue and that therefore they stood out from other people. Because the Gospel account, which is impartial and impersonal, does not merely call them righteous, but adds “before God”, which means that they made every effort to appear righteous to God, in accordance with the Gospel law. Because, with their prophetic gifts, we must assume that they had been granted a Gospel outlook, even before the Gospel. And because they were such people, they attempted, with their left hand, to conceal their God-pleasing way of life, that is, what they were doing with their right hand (Matth. 6, 3). And so, by their works and actions they applied the Gospel command. In this Gospel testimony to Zachariah and Elizabeth, it is abundantly clear that, in the best possible way, they observed all the commandments and teaching of Mosaic Law. And in doing so, they showed us that those who walk in accordance with the Law, either that of the Old testament or the New, are crowned with the rewards envisaged in the old legal code and are adorned with the highest virtues, which are granted by the Gospel estate. Such were the people, then, who were the parents of John, who was to prove to be a link between the Old and New Testaments and a real bearer of all the supreme qualities revealed in both. And, of course, it’s recognized that the Old testament came to an end with John. This is why people say that prophets continued to prophesy until John the Baptist came. And also that John is held to be the beginning of the New Testament, since he was the Forerunner to Christ Who signed it with His blood. Indeed, John preceded all the Apostles, since he had been sent to walk in front of Christ and to become the first fruit of all the saints who would proclaim the advent of the Kingdom of Heaven. Because he was the first to be told to preach the coming of the Kingdom of God, before Christ. And we might add that from the days of John the Baptist, “the Kingdom of Heaven suffers violence and men of violence take it by force” (Matth. 11, 12), and that the first “man of violence” was John, who showed us by his example that we can all take it “by force” if we conform our lives to the truths of the Gospel. And so John was begotten in the womb of his holy mother, who was endowed with the gift of prophecy, by a priest and prophet father who was adorned with a thousand and one shining virtues and especially with his love for God. John was the only person ever to be enabled to prophecy when he was as yet in his mother’s womb. He was allowed to recognize the Lord Christ, who was in the Virgin’s womb, and thus became the only human being ever to have borne the Holy Spirit when still in the womb. He gave us the marvelous reality of an infant that gestated another while being gestated himself. He was gestating in the womb of his mother, and himself gestated the grace of the Holy Spirit. He gestated the prophecy and, before he was brought to term and born, he gave birth to the Grace of the Holy Spirit. Because, as God’s prophet Isaiah says (Is. 26, 17-8), prophets receive the prophetic message and bear it within themselves with pain. Then, when the time comes for them to serve the Holy Spirit, they reveal to people the message they’ve been keeping as a secret, just as if they were bringing a child into the world. But John followed this established prophetic procedure immediately after his wondrous conception. As we’ve said, he was conceived in the barren womb of his elderly mother, where his elderly father had left his seed. From then on, he naturally rested until the moment the Virgin met his mother, since his mother’s care and affection demanded this. But he had no desire for the Grace of the Holy Spirit, which he had inside himself, to remain inert (because as the angel testified, he was full of the Holy Spirit) even when he was still in his mother’s womb. And so, when five months of his gestation had passed, his mother continued to hide herself from the eyes of other people and refused to reveal that she was about to become a mother. These five months correspond to the five senses that people have and which Elizabeth wanted to avoid. She wished to hide both herself and the prophet she was carrying within her, no matter how much he wanted to reveal himself. So the sixth month came, and the Virgin arrived, bearing in her womb the Creator of the whole of Creation. Because, in the sixth month of Elizabeth’s pregnancy, Mary conceived Him Who created the whole world in six days and, in particular, human beings on the sixth day. Him Who regenerated humankind with His cross when they had become depraved through their sins. Then John was unable to keep quiet. He, who was the voice of the Word, could not consent to be silent in the presence of that Word. And so, before his time, he became a herald of the advent of Christ, because nothing could prevent him from doing so, not even the fact that, as an embryonic infant, he still didn’t have the use of his voice. And so he rejoiced and was glad, through the Grace of the Holy Spirit, and declared that He had arrived, Who would wipe away every tear from our faces and would grant peace and joy to all the world. He figuratively stretched out his finger and indicated the Lamb of God, Who would be sacrificed for us, the wild goats, for the sins of all of us and would bear on His shoulders the guilt for all the sins of the world. He spread out both of his hands and, in this way proclaimed, before his time, the banner of the Cross. The standard which He, Who was then in the womb of the Virgin, came to raise against the demons. John stood upright in the womb of his mother and, with this stance, mystically sang of the raising of all from the depths of hell. This raising was granted to us by Him Who was hidden in the grave and was at that time, hidden in the uninseminated womb of His mother. It’s as if John was at odds with his mother: he wanted to proclaim all this, whereas she wanted to keep him within the physical restrictions of the womb, against his will, a captive, unless he would agree to her lending him her voice so that she herself could declare what she did to the Blessed and Holy Virgin: “Blessed is the fruit of your womb. And what have I done that the mother of my Lord should come to me”. This is John himself speaking, even if the words actually came from the mouth of Elizabeth. This voice is one and the same as the voice with which he addressed Christ when He came to be baptized in the Jordan, where John was baptizing people. When he saw Him coming, he said: “I need to be baptized by you and you come to me?”. You see the correspondence in the manner of speaking? It was he who was speaking then and is speaking now. Then he was speaking with his own voice; now he’s speaking with that of his mother.